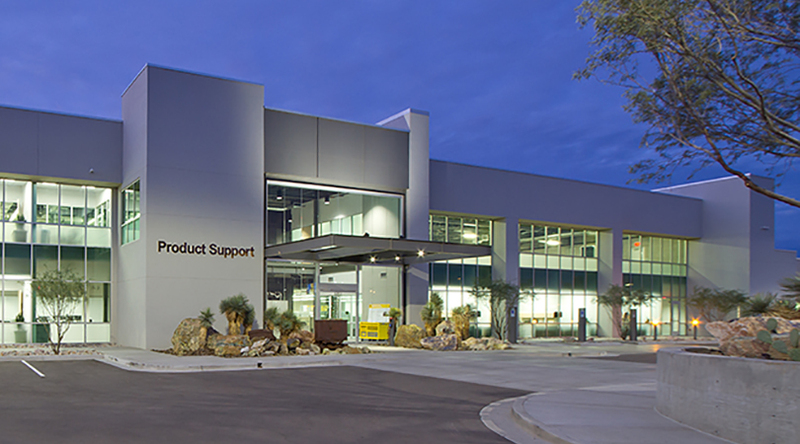 Saemisch & Di Bella was honored to be part of the construction on the new, 90,000 square-foot Product Support facility at Empire Southwest. This state-of the-art facility is the first of its kind in the Southwest, featuring two employee parking lots covered by solar electric arrays, provided by Empire’s very own solar division. Providing over 35% of the building’s electricity requirements, Empire Southwest is really harnessing the power of the Arizona sun! Working with companies that are invested in both families and their local communities is a big reason we at Saemisch & Di Bella do what we do. We love working with local businesses that share these values, and find great joy in the process of bringing their architectural visions to life. Both Empire Southwest and Superstition Springs Chrysler consistently bring care and attention to detail to their stellar customer service interactions, and we are proud to be a small part of their ongoing success. This summer, follow the lead of Empire Southwest and Superstition Springs Chrysler, and focus on quality family time. With proper safety precautions and a sense of adventure, your summer road trip is bound to be one lifelong memories are made of. Previous post Play It Safe This Summer!